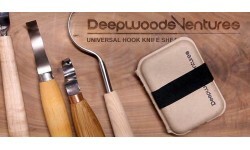 Great carving knife to take a lot of wood off easily. This is an alternative to the drop point carving knife we are all used to. A nice curved blade for easy carving with a tiger/curly maple handle. 3 lengths and 3 handle options available. 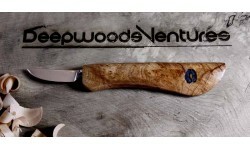 Wood Carving Knife- General Carver - Deepwoods Ventures - Deepwoods VenturesThe genereal carver is a handforged carving knife with highly figured hardwood handles or just buy a blank.